On May 11, 1544, John Luttrell was knighted at Leith by the Earl of Hertford, the English King's Lieutenant in Scotland, immediately following the capture and burning of Edinburgh. Was in command of over two hundred men at the battle of Boulogne; and, "he led three hundred men in the vanguard of the English army at the battle of Pinkie." "On the 3rd of December, the Earl of Angus and the Rhinegrave, with 50 lances and 200 light horsemen, appeared before Broughty Craig, and Sir John Luttrell, 'seeing that they sought some pastime', sallied out with thirty horse and some footmen. After some skirmishing, the Rhinegrave retired and tried to led the English into an ambush. Luttrell had, however, foreseen such a scheme and had stationed some signalmen in the fort, to watch the movements of the enemy. Duly informed by them, he retired to a hill and there gallantly defended himself against superior numbers until reinforcements, hidden behind the hill, came up. The enemy were thus caught in the trap which they had prepared for him." "He was trusted as a diplomatist no less than as a soldier, and, in March 1549, he was appointed one of the two English commissioners to treat with the Earls of Argyll, Athol and Errol and others, with a view to the expulsion of the French (who were allied with the Scots against the English) from Scotland, and a marriage between Edward the Sixth and Queen Mary. The negotiation, however, came to nothing." "The last of Sir John Luttrell's exploits seems to have been a raid in which he burned several villages and took prisoner a certain Monsieur de Toge, as recorded in the journal of the young English King." In the early part of 1550, the Scots, along with their French allies, defeated the English at Broughty Craig and captured Sir John Luttrell, whom they held for ransom. The Council at Westminster ordered the payment of the ransom for Sir John. "Although defeated, he was in no sense disgraced." "That Sir John Luttrell, in consideration of the notable good service he hath doone unto the Kinges Majistie during all his warres, shall have landes to the value of 100 markes by the yere during his Highnes pleasure." In addition, Sir John further "extracted from the government no less than 3,200l. for 'the waiges of himself and his souldiours in the Northe'." Quotations above are from Maxwell-Lyte's "A History of Dunster". Sir John Luttrell "took the Queen of Scotland prisoner on the field of battle" according to "The Ancient History of the Distinguished Surname Luttrell" - a publication of1994, by The Hall of Names, Inc. However, there is no reference to documentation for this allegation and according to one who has researched the family documents at Dunster Castle, there is no evidence of such an event. 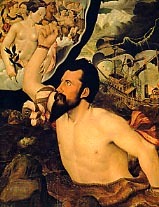 Sir John Luttrell's valor is immortalized in the dramatic and mysterious allegorical portrait by Hans Eworth which hangs in the Hall at Dunster Castle.